The push-up is one of those basic exercises, casually thrown at military cadets as a punishment during their training days, in batches of 100s. In fact, says Dr Raju Easwaran, a sports surgeon, the single-arm push-up (with one arm behind the back) is an important yardstick for most commando training around the world. If you’re not going commando, here’s a guide to doing one and getting yourself toned: “It works almost every muscle in the chest, upper back and arms, but it also helps build the core muscles,” says Dr Easwaran, who is a senior consultant with Max Hospitals in Delhi. “This do-anywhere body-weight exercise has multiple variants, so it’s versatile enough for you to start with the simple wall push-up, used as a rehabilitation tool by physiotherapists for people recovering from a shoulder injury or surgery,” he says. You could then progress to placing your arms at a higher level (like a step), or performing it with the knees folded, quads on the ground. When starting off, you may use a push-up handle for stability. Avoid it if you have a rotator cuff problem (the muscles around the shoulder). For the rest of us, “Ants can lift many times their weight; surely we should be able to lift at least our own,” says Dr Easwaran. Give yourself 45 days to do a regular push-up. Praveen Nair, Mumbai-based personal trainer to Bollywood stars like Shraddha Kapoor, Aditya Roy Kapoor and Sushant Singh Rajput in the past, gives us the perfect push-up position. Get your start straight: Lie down on the ground. Keep feet hip-width apart and get yourself up on the strength of your arms and chest. Stay on your toes and position hands slightly wider than the shoulders, forming a 90-degree angle to the ground. This is the high plank position. Place your hands flat, spreading the fingers out and grounding them. Align your neck and spine in a way that they form a straight line. Get your muscles and joints ready: Imagine squeezing something under your arm. Your shoulders should be drawn back rather than towards the ears. Be conscious of engaging your core: clenching the glutes and tightening the abs. Your weight will hinge on the three joints: shoulder, elbow and wrist, so keep your hands steady. Breathe steadily: Inhale as you go down, keeping the elbows close to the body, and not fanning out. This is called an eccentric muscle contraction, when muscles are lengthening and you are building strength. Exhale on the way up. This is called a concentric muscle movement, when muscles are shortened, with some weight on them. Studies have shown that eccentric movements are more important than concentric to build muscles mass. Simply put, this means that it is in the downward movement of a push-up, towards gravity that you’re actually building your body. Nisha Varma, an American College of Sports Medicine exercise physiologist and a Reebok Master Trainer based out of Pune, points to common errors people make. The progression is too quick: Perhaps because of the proliferation of online videos that glamourise the advanced forms, people end up doing a single-hand push-up teetering to one side. Focus on posture, progression and your own fitness level so you don’t injure yourself. The lower back falls in: When you dip, the hip, stomach, and knees touch the floor or are lowered before the chest comes down. This shows lack of core control. The push-up is not completed fully: When a person does not come back to the high plank position, and comes up just about 80%, the serratus anterior, muscles deep within the chest, are not activated. Again, if you don’t go down completely, you’re not experiencing the full range of motion. Vinod Channa, an Action-certified personal trainer to Bollywood stars Shilpa Shetty and John Abraham, says it’s necessary to develop mobility in the joints and strength in the muscles before you actually begin a push-up. Bench press: Lift what you can, even 2 kg, either dumbbells or a bar. Get comfortable doing 10 reps; progress to doing 2 sets, then 3. Increase weight and sets gradually. This will build strength in your chest, arms (especially the triceps) and shoulders. 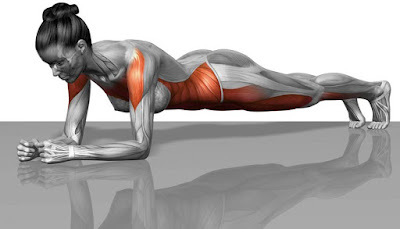 Planks: Hold a high plank for 10 seconds and build to 30 seconds. Introduce the forearm plank and again progress from 10 seconds. Go on to the side plank. These will strengthen the core. Mobilisation: Before you begin, warm up the muscles and joints, so you don’t get injured. Do about 10-15 rotations of the neck, shoulders, wrists, hips and ankles.